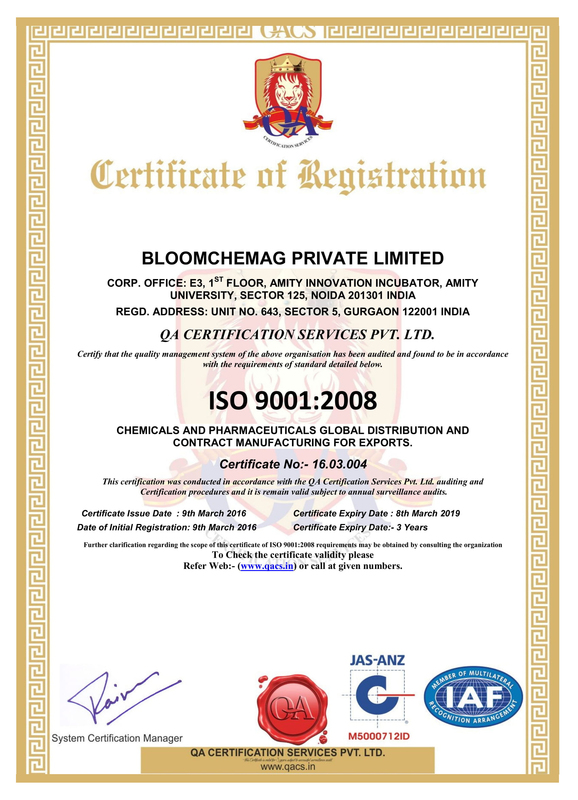 Bloomchemag, a global player in chemical distribution and as an integral part of the value chain, Bloomchemag is committed to sustainability in the industries in which we operate. Our business operations are grounded in Total Quality Management (TQM) practices. We incorporate health, safety and environment (HSE) management systems into all phases of the chemical life cycle, and have pledged continuous improvement to protect the safety of all our stakeholders like Clients, Suppliers, logistics partners, technical partners, vendors, visitors to our website and employees. We are ISO 9001:2008 Certified as all our processes are well documented and assessed by Surveyors. We maintain documentation of every transaction, with easy retrievability and traceability at a later date, for any of our stakeholders. Adding value is our over reaching objective. To support this aim, we at Bloomchemag believe that the business practices we follow today must also benefit the needs of future generations. It is important to operate safely, act as a true corporate citizen, minimize our impact on the environment and ensure ours and our partner’s financial viability. Our products travel more than 1,000,000 miles every year, delivering chemicals from Asian region to Europe and African Region. And driving this journey are hundreds of supply chain operators, whose health and safety is paramount to us. As part of our responsible distribution ethics, we engage only with those logistics companies who declare upfront these sustainable policies. Because of the commitment we make to our stakeholders, and the value we have for our people, we believe that it is not only our responsibility, but also our mandate to keep safety, compliance and sustainability at the very core of everything we do. We are a part of DUN & BRADSTREET global database which allows us to act responsibly towards the society in pursuit of meeting our business objectives. Bloomchemag BVBA is one of corporate members of ZENITO, a source providing social security to the companies present in Belgium. Bloomchemag’s approach to data privacy is absolute, as we understand our responsibility to protect privacy of EU citizens under The EU General Data Protection Regulation (GDPR). As an employer of equal opportunity, we make sure all the statutory compliances are always met in every country we employ or plan to employ people. We invest in training and upgradation of skills so that our people are ready to face the challenges of every changing situations and can serve our customers better in any part of the globe. OUR FIRM STEPS TOWARDS MORE SUSTAINABILITY IN OUR OPERATIONS CONTINUE TO MOTIVATE US IN OUR BUSINESS DECISIONS….